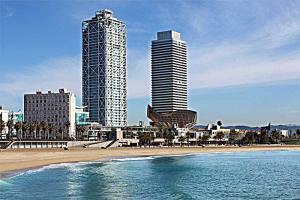 The spectacular Hotel Arts Barcelona is a landmark on the Barceloneta boardwalk. 44 stories of blue glass and exposed steel soar high above the Mediterranean. The hotel's terraced gardens bask in the dappled shade of Frank Gehry's monumental golden fish sculpture, one of Barcelona's most iconic works of contemporary modern art. 483 luxurious rooms offer sweeping views of the sea or city.